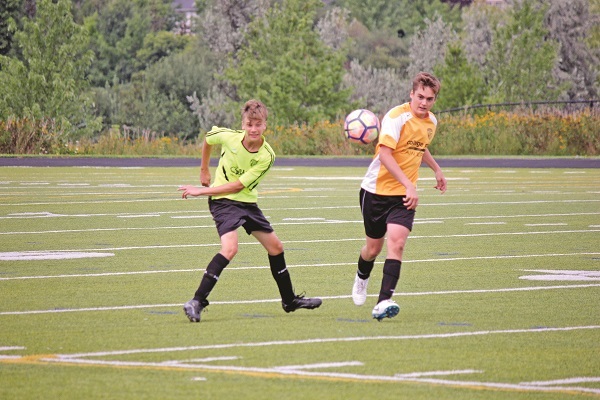 The Aurora Youth Soccer Club closed the book on its season last weekend at the annual Stinger Cup tournament, the club’s house-league division championships. Hundreds of players age 5 – 18 took to the fields at Magna, St. Maximilian Kolbe, and Sheppard’s Bush in Aurora, a lively atmosphere for both kids and parents. The Aurora Lions Club and Optimist Club of Aurora were grilling hamburgers and hot dogs all weekend, while the players battled it out on the pitch for town-wide glory. The first kick-off came Friday evening, with the festivities wrapping up at the U18 level on Sunday evening. At the under-14 level, Team Navy bested Orange 5 – 0 in the boys division, while the girls division saw Lime topple Royal 2 – 1 in extra time. Grey also rode to a 5 – 0 victory over Orange in the boys Under-18 league, while Sky Blue reigned over Lime 4 – 0 on the girls side. With the trophies all handed out, the AYSC has now opened the registration process for the Fall 2018 and Winter 2019 indoor program, with more information found at www.aysc.ca.